This is a scalable context timeline. It contains events related to the event April 27, 2011: Fox News Guest: Obama’s ‘Refusal’ to Acknowledge Easter Evidence He Is ‘Muslim’. You can narrow or broaden the context of this timeline by adjusting the zoom level. The lower the scale, the more relevant the items on average will be, while the higher the scale, the less relevant the items, on average, will be. PolitiFact, the nonpartisan, political fact-checking organization sponsored by the St. Petersburg Times, debunks Internet claims that Senator Barack Obama (D-IL), a presidential candidate, is a covert Muslim whose middle name is Mohammed. The claims appear to be sourced from anonymous emails circulating throughout right-wing blogs and organizations. 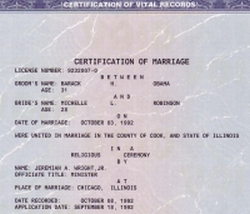 PolitiFact writes: “First off, Barack Obama’s middle name is not Mohammed; it’s Hussein. He was named after his father, a Kenyan who came to the United States from Africa as a student.” PolitiFact also verifies that Obama is not a Muslim, “covert” or otherwise. Obama is a member of the Trinity United Church of Christ in Chicago (see January 6-11, 2008). PolitiFact notes that the emails contradict themselves, on the one hand making the claim that Obama is a Muslim and on the other attacking his membership in Trinity United. Obama campaign spokesman Robert Gibbs has said, “To be clear, Senator Obama has never been a Muslim, was not raised a Muslim, and is a committed Christian who attends the United Church of Christ in Chicago.” [St. Petersburg Times, 1/11/2008; St. Petersburg Times, 1/11/2008] PolitiFact does further investigation and again debunks the claims months later (see April 18, 2008). PolitiFact has already debunked earlier claims that in 2005, Obama took his Senate oath of office on a Koran, when in reality he used his family Bible (see December 19, 2007). A recent spate of chain email attacks on presidential contender Barack Obama (D-IL) include claims that Obama may be the Antichrist of Biblical prediction. PolitiFact, the nonpartisan, political fact-checking organization sponsored by the St. Petersburg Times, notes that the email entirely distorts the words of the Book of Revelation to make its claim. The email reads: “According to The Book of Revelations the anti-christ is: The anti-christ will be a man, in his 40s, of MUSLIM descent, who will deceive the nations with persuasive language, and have a MASSIVE Christ-like appeal.… the prophecy says that people will flock to him and he will promise false hope and world peace, and when he is in power, will destroy everything is it OBAMA? ?… I STRONGLY URGE each one of you to repost this as many times as you can! Each opportunity that you have to send it to a friend or media outlet… do it! If you think I am crazy… Im sorry but I refuse to take a chance on the ‘unknown’ candidate.” PolitiFact notes that there are at least 635,000 hits on Google for the search term “Obama + Antichrist,” indicating that the subject has a certain interest to many. There are also literally thousands of blog posts about “Barack Obama the Antichrist” and such. PolitiFact states flatly, “Nothing about this detailed allegation is true.” According to PolitiFact’s research, which includes interviews with two religious scholars, the email makes a number of egregious errors. The email falsely says that the Book of Revelation uses the term “anti-christ” or any such term. Religious studies professor Dr. James D. Tabor tells PolitiFact: “The word Antichrist is not used in the Book of Revelation so this is important to point out. Everybody thinks the word is used.” Dr. L. Michael White, a professor of classics and religious studies, adds, “First and foremost, the word Antichrist and a figure called the Antichrist never occurs in the Book of Revelation in the New Testament.” There are characters in Revelation that some interpret as being the Antichrist, particularly one beastly figure in Chapter 13 “having seven heads and ten horns, and upon his horns ten crowns, and upon his heads the name of blasphemy” that some consider to be an allusion to the Antichrist. “It’s only in Chapter 13 and you could almost miss it,” Tabor says. White notes that most Biblical scholars do not consider that figure to represent the Antichrist. “It wasn’t there in the Bible,” he says. “It emerges in the Middle Ages. It’s something historians deal with.” The term does appear a few times in other books of the Bible, specifically First John and Second John. The Bible does not identify the Antichrist as being Muslim; Islam was not founded as a religion until 400 years after the completion of the various books of the Bible. “A Muslim would be a monotheist and the last thing a Muslim would do is have anyone worship anyone other than God,” says Tabor. And Obama is a Christian, not a Muslim (see October 1, 2007, December 19, 2007, and January 11, 2008). Fox News’s morning talk show Fox and Friends hosts the Reverend Robert Jeffress, who repeatedly suggests that President Obama is a “secret Muslim” (see October 1, 2007, December 19, 2007, Before October 27, 2008, January 11, 2008, Around March 19, 2008, April 18, 2008, and April 26, 2011). Jeffress, the senior pastor of Dallas’s First Baptist Church, tells interviewer Steve Doocy: “Steve, let’s look at what’s really going on here. On the one hand, we have a president who never met a Muslim holiday he didn’t like, or at least wasn’t willing to issue a proclamation for; and on the other hand, here he is refusing to acknowledge publically the most important event in Christian faith, the resurrection of Jesus Christ from the dead.” Jeffress is referring to Obama’s supposed refusal to acknowledge Easter. “And yet the White House is wondering, why do 20 percent of Americans believe the president is a Muslim? Well, as my kids would say, ‘Duh.’ You know, I mean, it’s actions like these that really make people wonder what it is the president really believes.… I really think, Steve, there’s only one of two explanations. Either he has advisers who are telling him that it’s politically expedient to ignore Christianity and elevate other world religions like Islam. And if that’s the case, Republicans need to pray that those advisers stay in place through the 2012 election cycle. The only other explanation is that there’s something deep within the president himself that will not allow him to issue these public proclamations about Christianity, when he on Easter will issue a proclamation about Earth Day, or he will recognize Muslim holidays. I think either explanation is deeply troubling for Christians.” [Media Matters, 4/26/2011; Media Matters, 4/27/2011] On the same day, pundits at Fox News and the Washington Times attack Obama’s April 24 attendance of Easter services at Washington’s Shiloh Baptist Church, claiming his choice to attend that church is evidence that he is a “black nationalist” (see April 27, 2011).